Located right behind the palace on the Dam Square, this Irish pub is vibrant, welcoming and full of life. The crew at the bar is fun and engaging and if you think you will walk away in an hour, you are mistaken, for they will keep you occupied for hours together, owing to the perfect ambience for watching rugby at the pub. Fish and chips at the pub are yummy. Make sure you try them. With a friendly staff, a cool atmosphere, lots of beer and good food, you can definitely bank upon the pub for lively and good times. 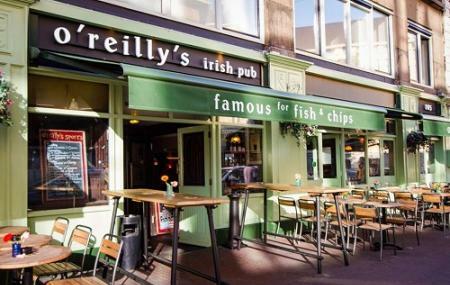 Explore O'reilly's and other prime spots of the city using Amsterdam trip planner. Fine Accommodation options like Lloyd Hotel And Cultural Embassy, Q-factory Hotel and Amsterdam Tropen Hotel will meet your requirement of where to stay in Amsterdam. Curated Amsterdam vacation packages await! Book the best ones and start turning your dream into reality.Discover various ways for how to reach Amsterdam and complete the booking by choosing your mode of transport. The irish barman seems like a nice guy who knows his stuff. Great gin tonics. Looking forward to try the cocktails. I couldn't last time as they were half an hour to closing time and didn't allow me. Other than that, looks like a great bar overall. Went to watch the football and it was an actual pub which is good. Couldn't find any others like it in the city. Would definitely recommend going here if you want to watch the match in a familiar setting. Very nice quality, i took stuffed chicken with fries and the sauce was very tasty. Chicken was well cooked. I recommend this dish to others. The price was ok and the atmosphere was excellent. Great breakfast served until 2pm! Several other dishes, I think I had shepards pie also and it was good. I have been there three times, no complaints. Beware of the super steep stairs to the restrooms in the basement!! O'Reilly's is the closest thing I've found to the bars back at home in Ireland having lived in the Netherlands for 3 years. Considering the huge capacity the place remains personal and quickly served. This is attributed to an avid staff that are well managed. If you're looking for a huge selection of reasonably priced food and beer with multiple screens to watch sport on, this is the spot!